So, you think your child could be a big music star? Everyone says so. But how can you get labels and managers interested in your child's music? Is there a sure path to break into show business? These are big questions without easy answers, including whether you should help your child break into the music industry at a young age. Here's how to go about trying to establish your child within the industry, and what you need to worry about along the way. First and foremost, you need to enter this process with a great deal of realism and pragmatism, and sharing that attitude with your child will help them develop the thick skin required to sustain a career in an entertainment field. Does your child have musical talent? Probably so. But here's the reality check: Your friends and family are not a good barometer of your child's talent. Don't assume anyone who hears your child's music will be as amazed as you are. Talented people get passed over in the music industry all the time, so even if your child is talented, there's a lot of luck involved in any entertainment field. Be prepared for how tough this process can be. Child music stars tend to fall into the pop category, and most can benefit from the major label marketing machine. Major labels don't listen to unsolicited demos, so to get their attention, you're going to need representation. An entertainment lawyer or a manager can help you here. The best way to get their ear is to look for some kind of personal "in" with them. If your child has recorded in a studio, someone at the studio may be able to put you in touch with someone who can help. Someone in your family or circle of friends might have a connection that can help. There is no substitute for word of mouth in the music industry. Try every angle you can to find some kind of tie to someone who can help, and go for it. Sometimes, that angle just doesn't exist. The best thing you can do is try to tap into your local music community. Explain your situation and ask for recommendations of people they have encountered along the way. Someone you know almost certainly knows someone who knows someone. Find them. If all else fails, use the internet to find music management companies. Also, look for entertainment lawyers in your area. Cold calling a music management company can be hard, but follow their procedures for submitting music. Meet a few lawyers and a few managers and see who fits and who is enthusiastic about the music. Finding the right person here is critical. Once this team member is in place, they can help you get showcases and meetings with labels that can help you introduce your child's music to the public. Praise is good. Critiques and advice for improvement are even better. Don't ignore the constructive criticism and advice music industry professionals give you along the way because it's not really what you want to hear. Don't choose to chase a music career over your child's education. In addition to their traditional schooling, make music education a priority. Encourage them to dedicate extensive time to practice. Performance standards for a child star can be taxing; they may need to be able to dance, sing, play an instrument and much more. Enroll them in appropriate classes so they can continue to develop their craft. Not only will this help them continue to grow their talents, but these classes can be good places to make the all-important connections. It also will encourage a work ethic when your child sees that he gets out of the class only what he puts into it. Establishing a music career can be expensive. If you hire someone, like a manager or an entertainment attorney, there will be fees involved. But you can avoid throwing money at the wrong things. Be wary of scams, and of anyone who wants you to pay for something upfront. For instance, there is rarely a good reason for you to pay to take part in a local showcase that promises "industry insiders." Reputable showcases seldom have entry fees. That goes for local talent shows as well. If the fees are minimal, a showcase may be worth it just for the stage time. But don't expect them to be the source of a big break, and don't spend a fortune on them. Likewise, never pay a music industry consultant or anyone else a huge sum of money in return for "guaranteed" results. You can't buy music industry stardom, and no one worth working with will make you any guarantees in the music industry. 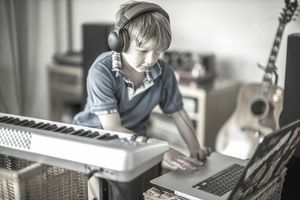 The bottom line is that there are no easy answers and no one easy path to establishing a music career for your child. The best thing you can do is adopt a realistic attitude and a lot of patience while you search for the right partner to introduce your child to major label opportunities. Along the way, encourage them to value their education and work hard to continue to nurture their musical talent. If there are open mic opportunities in your town that are age appropriate, then let your child get comfortable as a performer as you meet your local music community. These connections can help you later. A solid music career requires a good foundation. Now is the time to make sure you're building that. It will give you and your child much more stability down the line.